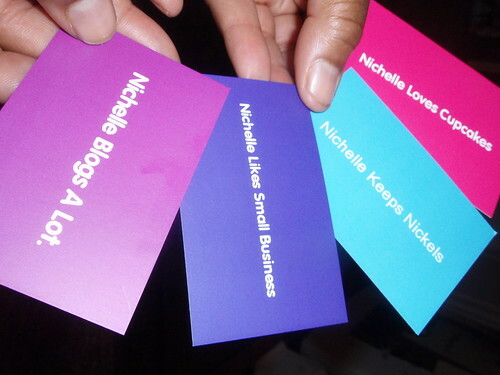 Moo has business cards! I ordered a few, and I have gotten loads of compliments on the cards. The paper stock is excellent as well. You can order 50 cards for $21.99 or 200 cards for $69.99. They are a little pricey, but so cool. I was quoted in a CBS2 news segment about living green. Thanks to Noah and Piers being out of the country, I was asked to co-host this morning’s LikeMind here in NYC. LikeMind is a monthly coffee gathering where a mix of creatives, marketing, bloggers, start-up founders and freelancers and anyone else who is social in the early morning come and meet. We had a fun group which included Luke from Technorati, Adam from Help I Need Help, James, Peter, Shayna, Adam, BrianVan, Daniele from LeftLoft, and the whole team from Raisanen Creative. Discussions ranged from live music, twittering, headaches, art parades, design, cupcakes and branding. The next LikeMind will the third Thursday in October (October 17) and it is held in over thirty cities all over the world. Hope to see you at the next one! I attended Jelly today and I had a meeting at Bottle Rocket Wine. I scanned the shelves at the store and the Brut from New Mexico sounded cool, so I bought a bottle to share with the co-working crowd. Thanks to Tony for the new router, and thanks to Nancy for hosting today’s Jelly. Wow! Is this too good to be true? California-based investment firm Zecco lets you make 10 free month stocks a trades a month as long your maintain a $2500 balance. There’s also a social network component, ZeccoShare so you connect online with investors. I think Zecco would be good for newbie investors and investing groups. When a publicist emailed me about National Payroll Week, I first thought that this is not applicable to my readers, but then I know some entrepreneurs still have day jobs, or they have employees. For employees, you may want to re-allocate your deductions on your paycheck to create a flexible spending plan that works for your health insurance, commuter or dependent childcare needs. For employers/entrepreneurs, if you have people performing work for you but they are really employees rather than “independent contractors”, then set them up properly to avoid penalties. Some of my clients have raved about PayChex for outsourced payroll which is good for very small businesses. You can also check to see if you bank provides a payroll service. I know that one of my clients uses Bank of America’s payroll service, so if you already bank with them, then that may be an option. Find the best solution for your business, and budget to spend no more than $60/month on payroll services if you have less than five employees.